RVHS junior Eric Weber attempts a throw during the discus event at the Division II Region 7 regional meet on Thursday in New Concord, Ohio. NEW CONCORD, Ohio — The field has started narrowing. 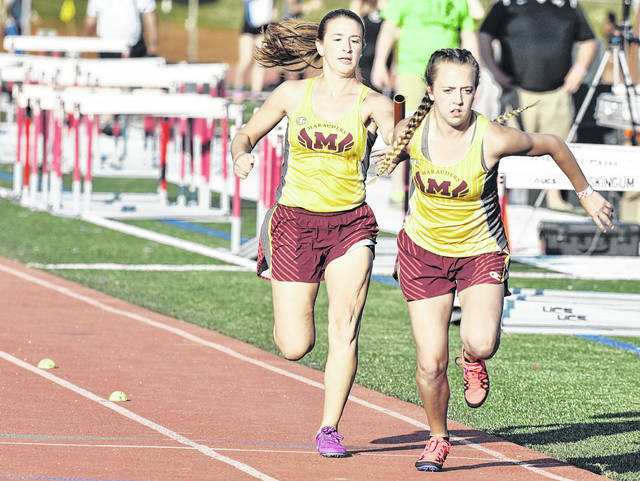 The opening day of the Division II Regional 7 track and field meet started Thursday at Muskingum University, with a total of 14 local athletes competing for a spot in the state tournament. With three events scored, Cambridge leads the boys competition with a team total of 11 points, followed by Indian Creek and Miami Trace at 10 apiece, respectively. River Valley is tied at 14th with Northwest with a score of four points, while Gallia Academy and Meigs have yet to score in an event. 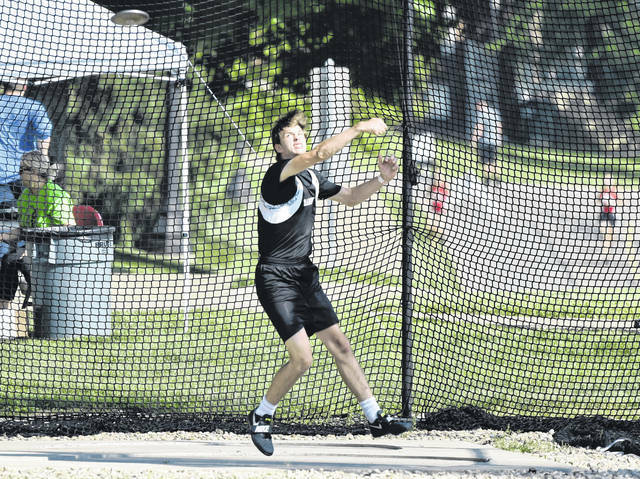 River Valley junior Eric Weber provided a top-five finish for the Raiders in the finals of the discus event with a fifth-place heave of 144 feet even. The quartet of Kyle Coen, Brandon Call, Nathaniel Abbott and George Rickett provided an eighth place effort in the boys 4x800m relay with a time of 8:26.75. The Blue Devils were also represented in three Day One events, as John Stout finished third in the 200m dash (22.67) and seventh in the 100m dash (11.27) preliminaries. Stout’s performances qualified him for a spot in the finals of both events on Day Two of competition on Saturday. 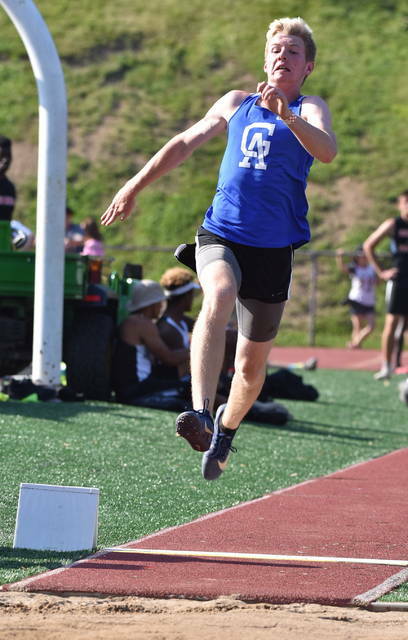 Gallia Academy junior Cory Call provided a 15th place finish in long jump with a distance of 19 feet, 3½ inches. With four events scored, Hillsboro leads the girls team standings with a score of 19. Sheridan trails by a single point at 18, while Logan Elm and Warren share the third place position with 10 points each. The Lady Raiders are tied with Fairfield Union, Chesapeake, Northwest and Ridgewood in 12th place with a score of five points. Gallia Academy and Meigs have yet to score in an event on the girls side. River Valley junior Kelsey Brown provided a top-five finish for the Lady Raiders in the shot put event with a distance of 34 feet, 7½ inches. Madison Tabor also represented RVHS in the shot put, finishing 12th overall with a mark of 32 feet, 1½ inches. Kassidy Betzing was the lone Lady Marauders individual competitor, finishing 10th in the 100m preliminaries event with a time of 13.06 seconds. The Meigs quartet of Betzing, Madison Cremeans, Lydia Edwards and Taylor Swartz earned 12th place in the 4x100m relay event with a mark of 53.11 seconds, while Creameans, Edwards, Swartz and Madison Fields finished 16th in the 4x200m relay (1:57.61) to close out Day One competition for the Lady Marauders. The final day of the D-2 Region 7 meet will be Saturday at Muskingum University. Visit www.baumspage.com for complete results of the 2018 Region 7 meet.